Our philosophy of service at Overlake Terrace Assisted Living and Independent Living encourages an active and independent senior lifestyle that supports residents' privacy and dignity. 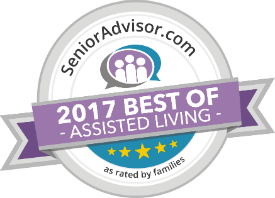 Our senior apartments are considered the premier Redmond senior retirement community. Overlake Terrace provides Independent Living, Assisted Living, Memory Care, and Respite services. Our community environment is rich in daily activities, with restaurant-style dining, graciously appointed interiors and apartment styles. Our senior housing environment provides full-service senior living with resort-style amenities in the heart of Washington, serving Bellevue, Bothell, Mercer Island, Redmond, Seattle, and surrounding communities. Come see for yourself. 10:00am: Beauty Salon is open! 9:00am: Beauty Salon is Open! Enjoy life and learn to live with the freedom of Independent Living. At Overlake Terrace we want to encourage inspiration and help achieve your dreams. Whether you are inside or outside, our activities team will always have fun and exciting events planned at Overlake Terrace. Weekly outings to attractions and educational hotspot in and around Redmond. Open 8am to 4pm, just call the ladies at (425) 883-0495 for an appointment. Nice location, nice rooms, residents were happy. Nice place, and close to my office, too.